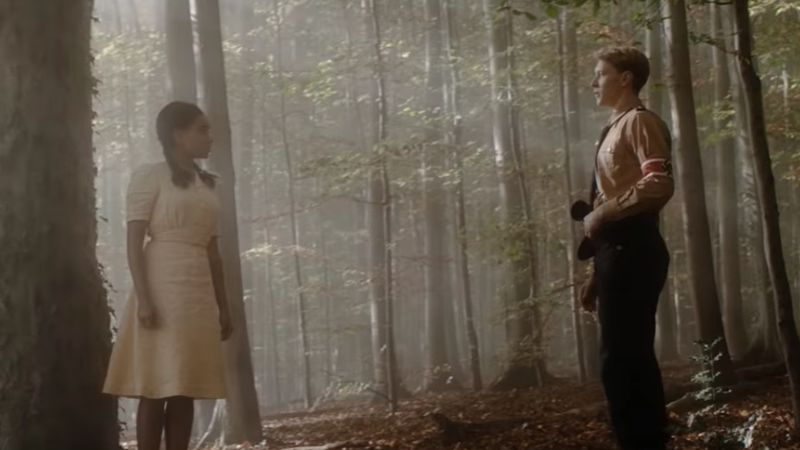 Where Hands Touch, director Amma Asante’s new film about a love story between a biracial black teen (Amandla Stenberg) and a member of the Hitler youth (George MacKay) in Nazi Germany, promptly received backlash online after it was made available on streaming services this month. And as some are pointing out, it appears the producers behind the film are turning to a commonly used tactic to quiet negative commentary—DMCA takedowns. The DMCA—the Digital Millennium Copyright Act—enables rights holders to quickly and pretty easily remove content online, and it’s a tool that has been often abused to censor speech. Filmmaker Charlie Lyne pointed out this practice in a Twitter thread on Saturday, claiming that the film producers issued a DMCA takedown request for a clip shared on Twitter that was accompanied by criticism of the film. Lyne shared the original, 14-second clip with Gizmodo. In it, MacKay’s character Lutz calls out for Stendberg’s character, Leyna, who is a prisoner in a concentration camp. They lock eyes, music swells, and the clip ends. Lyne was sent a DMCA notice on Saturday, informing him that the producers of Where Hands Touch Ltd had issued a takedown request for posting an unauthorized copy of the video clip. A handful of other Twitter accounts say they’ve had their videos taken down as well. Charlie Hanson, the producer of the film, told Gizmodo in an email that they “do not have the power to stifle criticism of the film. Everyone has been free to comment positively and negatively whether they have seen the film or not.” He argued that the film is only released in the U.S. at the moment, and that Where Hands Touch Ltd. “has only issued DMCA notices regarding breaches of copyright in cases where unauthorised clips of the film have been copied and posted online.” However, issuing DMCA takedown notices for short clips and blocking critics hardly signals a team that is open to negative feedback. The Electronic Frontier Foundation legal director, Corynne McSherry, told Gizmodo that sharing the 14-second clip online in the context of commentary of the film “sounds like a classic fair use,” a type of use that shouldn’t require permission from a rights holder under U.S. copyright law. “Is it really 14 secs? that’s ridiculous,” McSherry said in an email. She said that it appears both Lyne and the original poster were using only a small amount of the copyrighted work as part of commentary and that in this case, the film producers shouldn’t have used the DMCA to have the content taken down. They first have to consider fair use. “Unfortunately it is still far too common for copyright holders to ignore that rule, to ignore that prohibition, because the DMCA provides them with this very convenient, very easy way of taking down commentary that they don’t like,” she said, adding that it’s a relatively painless process. They simply have to send an email and fill out a web form, and service providers have “strong incentives” to comply with those requests, even though they might be unwarranted. As for those hit with a DMCA notice, if they want to appeal the takedown, they have to give the service provider—in this case, Twitter—their legal name, mailing address, phone number, email, Twitter username, specific URLs to where the content was originally found, a signature, a jurisdictional consent statement, and the following statement: “I swear under penalty of perjury that I have a good faith belief that the material was removed or disabled as a result of mistake or misidentification of the material to be removed or disabled,” according to a copy of the DMCA request Lyne provided Gizmodo.